Choosing a car seat is one of the more daunting of tasks when you’re expecting a new arrival. When I was pregnant with our first baby, I did everything I could to try to find out which car seat was best — aimlessly walking down the aisles of my local baby store, scouring the Internet for safety reviews, and compiling research in an effort to choose the perfect car seat. Fortunately, I found that all my investigative efforts (which at some point rivaled that of a seasoned CSI detective) kept pointing me to Britax. Now years later, as we are awaiting baby number three, I knew exactly what to choose — the Britax B-Safe 35. This sleek car seat hits all the marks, and then some, for reassuring the on-the-go parent that their new little one is riding around in first class style and safety. 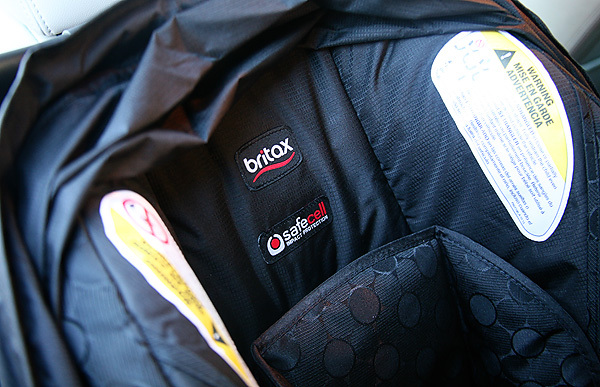 Have you heard about the recent Britax B-Safe 35 handle recall? 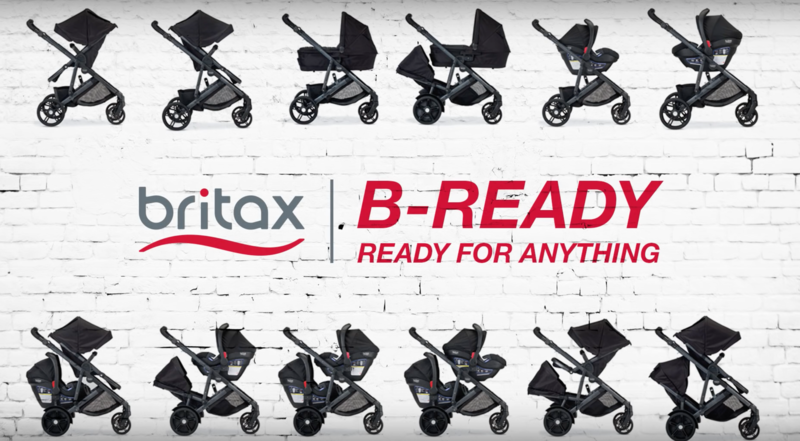 Read more about the details and how to see if your Britax is included on the Britax website. 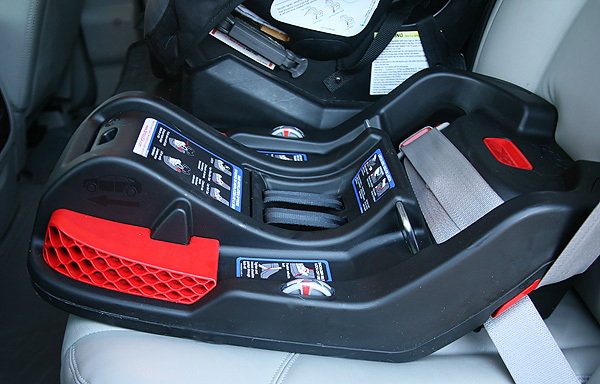 The Britax B-Safe 35 is top of the line in rear-facing car seats for infants 4 to 35 pounds. The B-Safe 35 features Britax’s SafeCell Impact Protection in both the car seat and its base to give your baby the ultimate care in car seat safety technology. With its deep protective shell and steel-framed base specifically designed to absorb the impact Baby might experience from any crash forces (including side-impact crashes), you can rest assure that your baby will be protected with the latest and greatest safety technology on the market to date. All that safety technology isn’t worth anything unless the car seat itself is installed right. 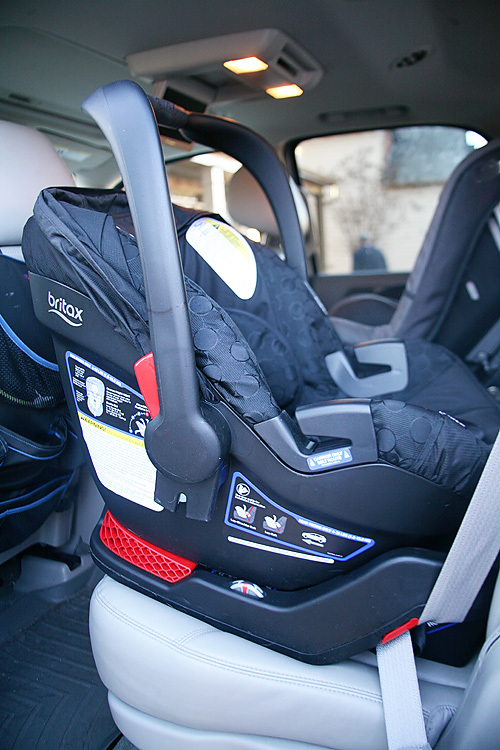 Car seats can be tricky to install, especially for a new parent, so it’s not shocking that the majority of car seats end up being installed improperly. Britax definitely took this into account when designing the B-Safe 35. We found installation to not only by easy, but that there were several features to assist in the ease of making sure we can protect our baby with just a few simple steps. 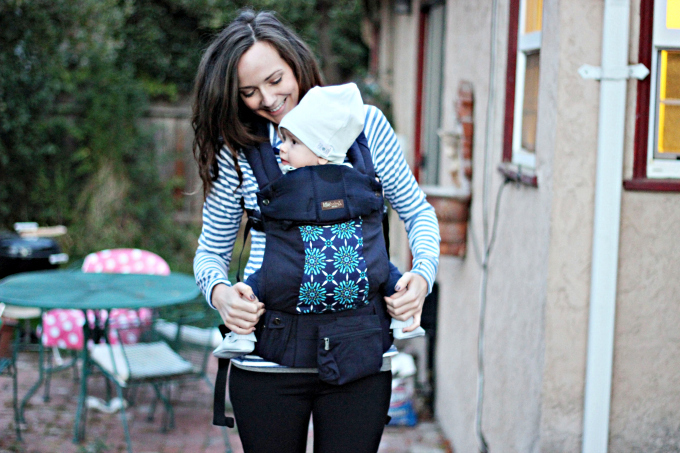 The easy to pull-center adjusting strap and the centered guide along the side of the base were just a couple of the features included to help give us the peace of mind that we needed to know that our baby will be safe and sound riding around town. One of the biggest challenges for any parent having a new baby in winter is how to keep Baby warm while on the go. Fortunately, long gone are the days of having to tuck multiple blankets around your precious newborn (that inevitably will get kicked off in a matter of minutes) or having to throw a blanket over the top of the car seat in order to try to combat the elements. 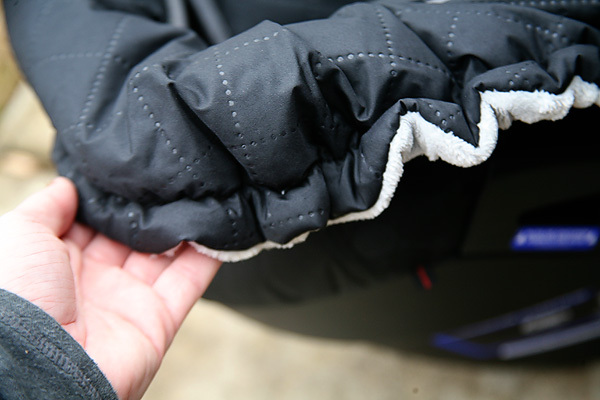 The Britax B-Warm Car Seat Cover allows the modern parent to keep Baby warm with the simple zip of a zipper. Without the hassle of worrying if anything will fall off, get lost, or constantly need to be adjusted, the B-Warm Cover is, hands down, one of our favorite winter accessories. Don’t miss these winter travel safety tips from our friends at Britax! 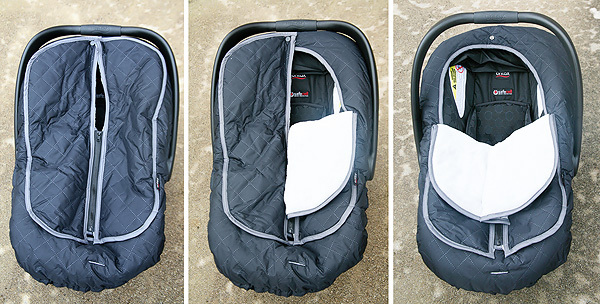 The Britax B-Warm Cover is super easy to install on your B-Safe car seat. 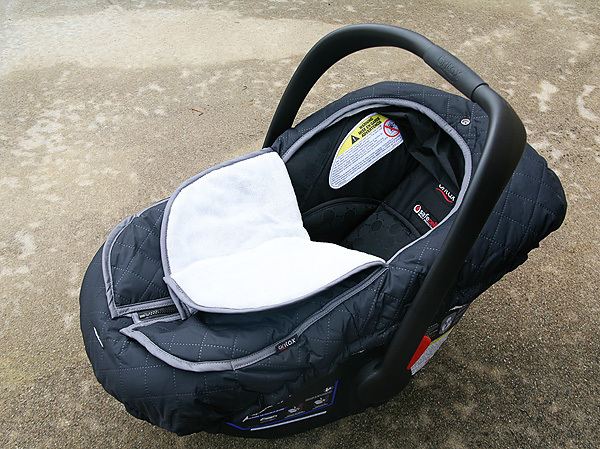 With just a quick stretch around the car seat, the insulted cover is set in place within a matter of seconds and you are ready to head out the door, reassured that your baby is warm and comfortable with in their seat. The Britax B-Warm Cover features also features convenient flip-up sides with a zippered snap enclosure that allows for quick and easy temperature adjustments. The cover also helps repel moisture, which is especially important when battling the varying elements of Mother Nature during winter. 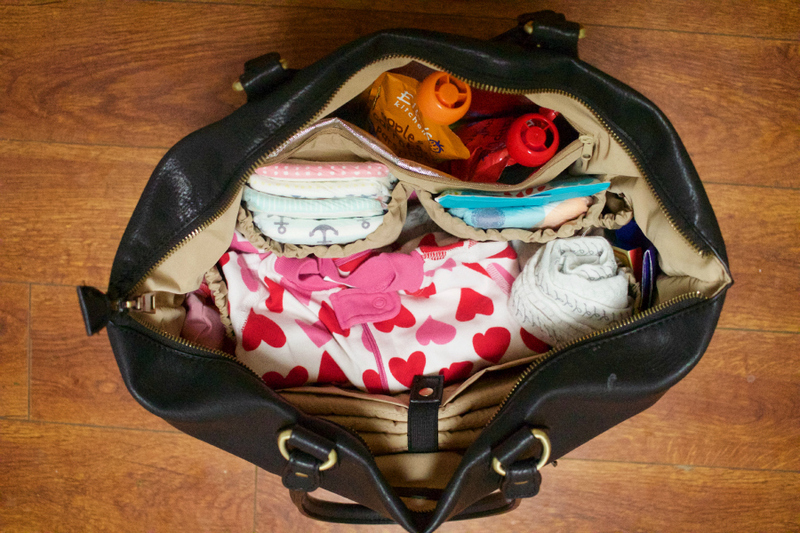 Knowing that baby will be cozy, warm, and dry during travel to and from one place to the next is just the reassurance any busy parent on the go needs. One winner will receive a Britax B-Safe 35 Car Seat ($210 value) and B-Warm Car Seat Cover ($50 value). Must be 18-years-old or older to enter and win. Carrie Beth and Jen are both 30-something mothers and wives, who happen to be best friends. They both love all things preppy, southern, and just plain pretty. Between the two of them, they have 5 precious little ones and constantly have a text conversation going on about the day-to-day of their lives and the crazy adventure that is motherhood. Whether it's trying to keep up with current fashion trends, finally getting around to that DIY project, or just dealing with everyday life with kids, it always keeps them laughing and it's always real life. 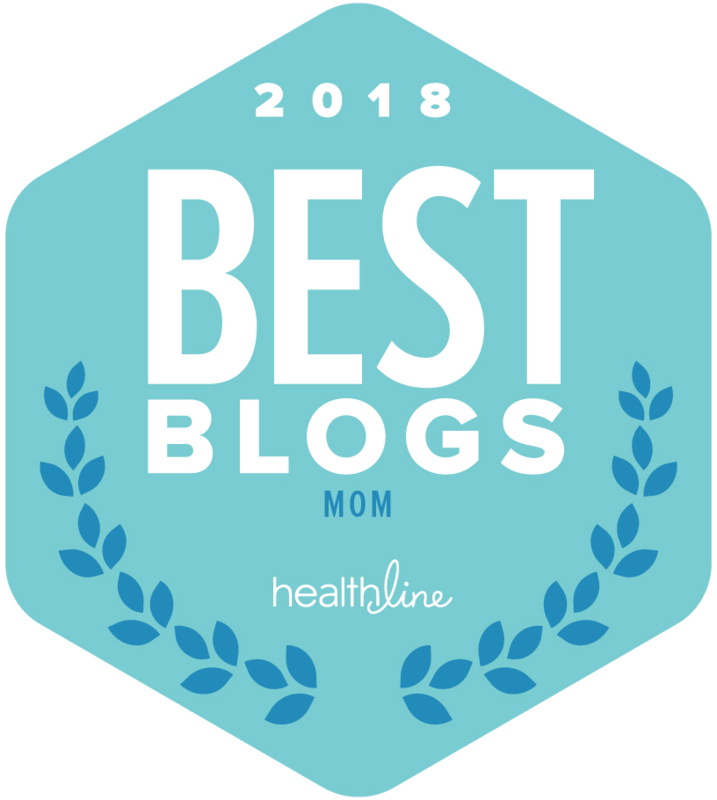 They share their ideas and stories on their blog, The Magnolia Mamas. 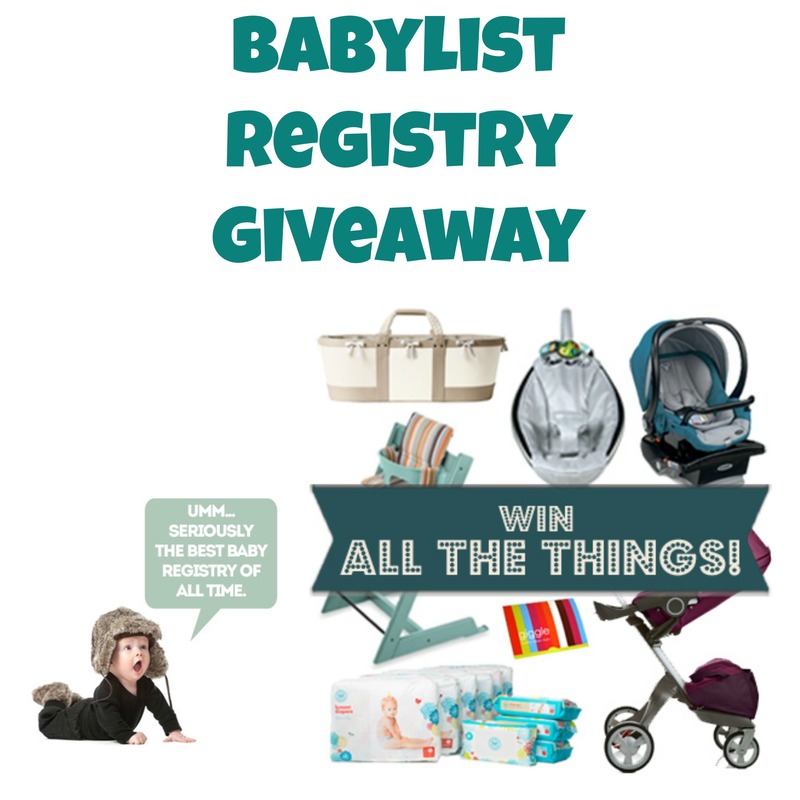 Awesome giveaway it’s so cold My son would love to stay cozy in ones of these ? Thank you for hosting. Grandbaby due in July…. northern NY has wicked cold winters! Would be a great gift for the Mommy-to-Be!! !